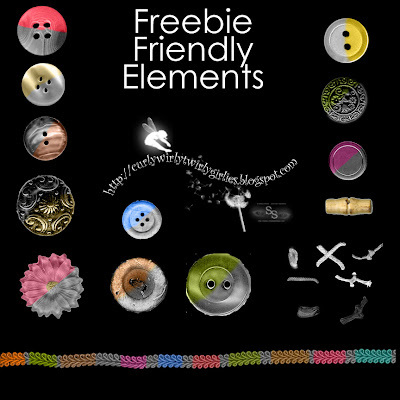 So I thought I would share some items that are Freebie Friendly. These have a different set of TOU to things I have made using commercial actions, brushes or products. They can be shared if altered by you as long as YOU ARE OFFERING THEM FOR FREE TO ALL, not just to a small group and NEVER for profit. Charity kits is different, drop me an email. They do require acknowledgement, and the usual requirements of no hotlinking, renaming, or distributing. Send people to this blog. It isn’t that hard. And if you do produce something I would love to see it. All the pieces are old scraps from the button tin or the like that I have scanned and extracted. There are some stitches and knots to hold down those buttons so they are anchored to your pages. It has taken a bit of time to extract, but it is a means of practice for me. The braid was right up there with the chain from the other day. But practice makes perfect LOL and as I overdid it on my sprained ankle yesterday I am back on a sit down and rest order from my hubby. So grab them, colour them, decorate them, and share them through RAK. One step at a time we can create change. As time permits I will probably offer more. Please note they are all greyscale, so if you are new to digi go and grab a tutorial from Misty, Shauna or Hummie (links are to your right), and have a go at recolouring. Thanks! I love that I can make them any color I want. thanks for sharing some freebie friendly items - I've just finished my 4th freebie kit and I like to offer a bit of variety and it's nice to get something to use that you don't to buy, as I never plan to open a shoppe - thanks for that generousity - and I do know how difficult it is to cut/extract, I've tried a few things and it is time consuming. thank you so much for all the great and wonderful freebies.